To Cite: Tomaj O K, Estebsari F, Taghavi T, Borim Nejad L, Dastoorpoor M, et al. The Effects of Group Play Therapy on Self-Concept Among 7 to 11 Year-Old Children Suffering From Thalassemia Major, Iran Red Crescent Med J. 2016 ; 18(4):e35412. doi: 10.5812/ircmj.35412. Background: Children suffering from thalassemia have higher levels of depression and lower levels of self-concept. Objectives: The aim of this study was to determine if group play therapy could significantly increase self-concept among children with thalassemia major ages 7 to 11 years old in teaching hospitals of Golestan province, Iran, in 2012. Patients and Methods: In this randomized, controlled clinical trial, 60 children with thalassemia major were randomly assigned to intervention (30 children) and control (30 children) groups. The intervention included eight 45 to 60 minute sessions during four weeks, during which the intervention group received group play therapy. The control group received no interventions. Self-concept was measured three times using the Piers-Harris children’s self-concept scale: before, immediately after, and a month after the intervention. Results: For the intervention group, results showed that the mean self-concept score was significantly higher at the second point in time compared to the baseline (P < 0.001), going from 60.539 to 69.908. Likewise, comparing the first and third time points, the mean score significantly increased and reached 70.611 (P < 0.001). Furthermore, changes in the mean score from the second to the third time point, though non-significant (P = 0.509), followed the trend, going from 69.908 to 70.611. For the control group, comparing the first, second, and third time points did not result in any significant change in the mean score (P > 0.05). Conclusions: The results showed that group play therapy improves self-concept in children suffering from thalassemia major. Thalassemia major is the most common genetic hemoglobinopathy and is accompanied by severe anemia. Hence, people suffering from this disease require frequent blood transfusions to survive, and, as age advances, psychological aspects regarding their quality of life become increasingly noteworthy (1). Prevalence of thalassemia major has reached 1 out of 100,000 people worldwide and 1 out of 10,000 in the European union (2). The disease has spread across a vast geographical strap from the eastern Mediterranean to the middle east, India, and southeast Asia and is growing outside of these regions due to mounting rates of immigration (3). In 1994, the world health organization declared that the disease carriers will comprise a minimum of 8% of the world’s population in the twenty-first century (4). In Iran, it is most prevalent alongside the Caspian sea and the Persian gulf (10%) (5), and it is found at rates of about 4% to 8% in other regions (6). Today, thalassemia major is no longer a childhood disease, as life expectancy has risen with the advancement of medical treatments. Now, patients face new concerns in life, such as settling down, becoming educated, and finding employment. Unfortunately, they constantly struggle with new complications of the disease and a higher risk of mental illnesses. If the patients fail to adapt to the disease and treatment strategies throughout childhood, they will encounter severe complications that will significantly influence their lives (7). This illness is an externally-imposed source of stress, of which complication and recurrence are major crises for the patient and his or her family (8). Similar to other chronic diseases, thalassemia contains an imperative and psychological aspect. The attitudes of the child, parents, and others involved, such as doctors and nurses, toward the treatment affect the child’s survival and quality of life, as evident by the fact that acceptance of treatment will result in growth and natural development (2). Very few studies have addressed the relationship between quality of life and the psychological state of children suffering from thalassemia major (1). Recent studies in developing countries such as India have reported a lack of attention to patients’ psychosocial well-being as the main cause of their deaths. Thalassemia challenges the patients physically and mentally and disrupts their quality of life (9). It is not hard to believe that these patients undergo a great amount of psychological pressure and struggle with lack of self-confidence and self-concept. Research shows that children with chronic diseases who lack social support have low self-concept and a distorted body image. In general, in chronic diseases such as thalassemia, especially in children, the psychological aspect is highly important, because as children grow they need to confront psychopathological disorders, such as negative body image, anxiety, depression, and failure to control aggressive impulses (1). In 1997, Aidin et al. reported that 80% of the children with thalassemia major have at least one mental disorder that influences their self-concept (10). Studies show that children suffering from chronic diseases will adapt better to the disease if they have positive self-concept (11). In a study by Pradhan et al. (2003), results revealed that children with thalassemia have higher levels of depression and low levels of self-concept (10). Shaligram et al. (2007) also consider psychological problems as a significant deteriorating factor for quality of life among children suffering from thalassemia major (12). Therefore, identifying and managing the psychological problems of these patients can enhance their medical outcomes and quality of life. Nurses understand the medical, psychological, and social needs of the children and have contact with their families. As such, they can play a crucial role in the children’s adaptation to the disease (13). To effectively help a child with an unpleasant body image, the nurse must identify the resources that support the child’s adaptation. Encouraging children to use their skills can help them to adapt to environmental changes and increase their self-esteem (11). One of the most important psychological and physical needs of children is to play games, which can enhance their intelligence, character, and social development. By playing games, children reveal their tendencies and relieve their anxieties (14). From a psychological point of view, playing games is also a proper method to facilitate children’s adaptation when faced with new tensions and recurrent admissions to hospitals. This method is well-accepted among children, parents, and nurses, since it is fun and pain-free (15). Playing games generates a nurse-child relationship based on trust, as it is a familiar and secure activity in an unfamiliar environment. In fact, natural games serve to reduce fear in order to aid in recovery following illness or injury and can be helpful in achieving medical objectives (16). It seems that play therapy is a sensitive and evolved technique, specifically geared for children, that prevents the development of future social and mental problems and helps children to grow properly (17). Success in play helps children to develop self-esteem, which they can experience through group play; even very small successes may affect the child’s self-concept. A positive self-image helps them feel that they are loved, valued, and able to do valuable work, and these feelings will result in self-respect, self-confidence, and a general sense of happiness and satisfaction (18). On the other hand, group play in the hospital is a well-recognized, valuable element in child health services, which can be provided at different levels of health care to accelerate the treatment process and reduce the need for medical interventions (19). In a clinical trial, William et al. assessed the effects of preoperative play therapy on school-age children and showed that play therapy could reduce anxiety and negative feelings considerably (20). Likewise, Zareapour et al. demonstrated that group play therapy reduces depression symptoms in children with cancer (17). Innate games, such as playing with mud, are known to be the most fundamental and fun activities for children. Since 1959, various forms of game play have been common in Britain’s hospitals, and, to some extent, have decreased the negative effects of mother-child separation and compensated for the educational shortcomings of doctors and nurses dealing with the psychological and emotional aspects of illness in children. To our best knowledge, no previous studies have addressed the effects of group play therapy on self-concept among children suffering from thalassemia major in Iran, and we assume that play therapy could improve self-concept and protect them against psychosocial problems. This study aims to verify the effectiveness of group play therapy to increase self-concept among children ages 7 to 11 years old with thalassemia major. This was a randomized, controlled clinical trial adopting a group play therapy intervention for 60 children with thalassemia major. The children were enrolled and randomly assigned to intervention (30 children) and control (30 children) groups. The research was conducted during nine months in 2012 - 2013 in the thalassemia units of two teaching, governmental, and referral hospitals of the Golestan University of Medical Sciences. Located in Gorgan and Gonbad, these hospitals have the maximum daily counts of admissions for thalassemia major in Golestan Province, northern Iran. Inclusion criteria were: displaying willingness to participate in the study, falling within the ages of 7 to 11 years, having no acute or chronic diseases other than thalassemia major, visiting the hospital regularly for blood injections, and being free of any known impairment, disabilities and cognitive-mental disorders. Exclusion criteria were absence from two or more consecutive sessions and the occurrence during the study of any incident that could affect a child’s self-concept. Group allocations were completely at random, based on hospital patient lists and with 15 children coming from each hospital. The type of randomization was simple. In the control group, after the intervention, two patients were not willing to fill in the self-concept questionnaire and they were excluded. 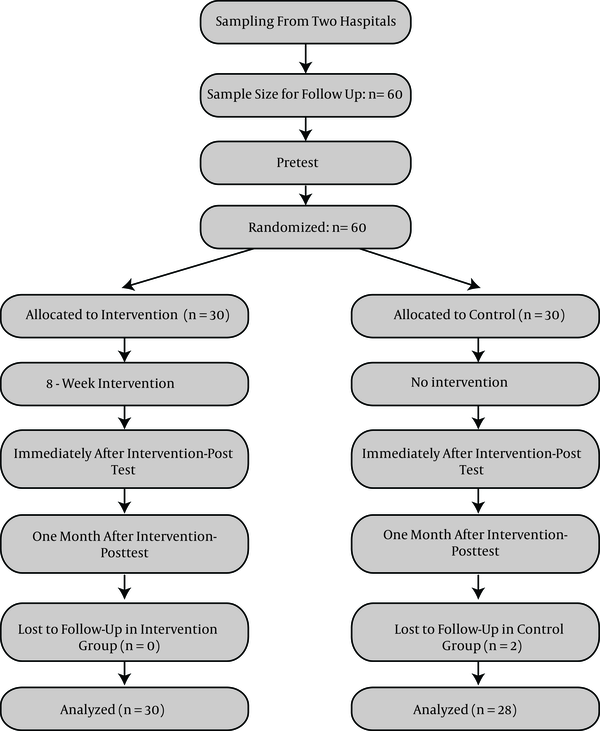 Figure 1 displays a detailed flow chart of RCT for the intervention and control groups. Subjects were enrolled on weekdays between 8 to 10 AM at the time of blood transfusion. The group play therapy intervention was held between 5 to 7 PM outside of the hospital. In the intervention group, parents were asked to bring their children to group play therapy twice a week (on Mondays and Wednesdays) for one month. Furthermore, precautions were taken based on the hospital’s visiting hours so that members of the two groups had no exchange of information during the study period. Data collection instruments included the child’s demographic questionnaire (age, gender, order of birth, education, physical activities, relationships, date of the first blood transfusion), the family’s demographic questionnaire (age, education, occupation, number of children, financial status), and the Piers-Harris children’s self-concept scale (21). The Piers-Harris scale is designed to evaluate self-concept among children and adolescents ages 7 to 18 years old. The scale is comprised of 80 items, each requiring either a “yes” or “no” response. These yes/no questions are grouped into six categories: behavior (16 questions), cognition and mental state (17 questions), physical appearance (11 questions), anxiety (14 questions), prosocial popularity (12 questions), happiness and satisfaction (10 questions). Each item is scored 1/0 for yes/no in positive items and the reverse for the negative items. Thus, the total score is 80, with a higher score indicating a more positive self-rating. This scale has been adopted in various studies in Iran (22, 23) and other countries (21, 24-26), and it has acceptable reliability and validity. Alaei Karhrudy et al. reported a content validity index of 90% and a Cronbach’s alpha of 0.91 for the instrument (23). It is worth mentioning that self-concept was measured through face-to-face interviews with children at three time points: before, immediately after, and one month after the intervention. Before the intervention, the children’s and families’ demographic features, along with children’s levels of self-concept, were recorded by questionnaires. Children in the intervention group were then divided into groups of seven to eight. They took part in eight sessions of group games, each lasting for 45 to 60 minutes. The activities undertaken during the sessions are listed in section 3.3. According to the research goals, these games were designed based on translations of Eric Berne (27), the play therapy techniques of Kaduson and Schaefer (28) and Reddy et al. (29), and Landreth’s games (30). First session: children met with one another and the researcher, who explained the activities, defined rules and tasks for each individual, and encouraged the children to play with play dough, with all materials for play having been prepared in advance. Second session: the group continued to play with play dough, along with coloring patterns. The final works were then photographed, and the photographs were stored by the researcher. Third session: instructions were provided, and the required facilities were prepared for playing with mud to encourage the children to generate diverse and desirable works of their own. Fourth session: the processes of playing with mud in parallel and one-by-one methods and using colorful materials to color patterns continued while the researcher photographed and stored the resulting works. Fifth session: the session consisted of providing explanations about the clay roundabout game and encouraging the children to maintain interactions and exchanges among group members. Sixth session: the group games of clay roundabout and pattern coloring continued, and the researcher photographed and stored the resulting works. Seventh session: group mud play continued, and the children were encouraged to tell stories using their own created works of art. Eighth session: having wrapped up the story-telling process, the children’s artwork was returned to them. Finally, a group photo of the participants and their artwork was taken, and awards were distributed. At the end of the eighth session and right after the end of group play, the level of self-concept was recorded via the Piers-Harris scale (21) in both groups. To ensure long-term effects, self-concept was assessed in both groups a month after the intervention. In carrying out their research, the authors thought deeply about and did their utmost to avoid certain ethical issues, including plagiarism, lack of informed consent, misconduct, data fabrication and/or falsification, double publication and/or submission, and redundancy. The purpose of the study and the study methods were clearly explained to the hospital authorities, head nurses, and parents. Written informed consent forms were received from parents, and oral consent was received from the children. The ethical committee of the research council of Tehran University of Medical Sciences approved the study procedure, assigning it the project number 90-04123-16112, under the code IRCT: 201112221788N. The Kolmogorov-Smirnov test confirmed that the self-concept scale was normally distributed, but age did not fit the normal distribution. Data were summarized using descriptive statistics such as mean and standard deviation. Repeated measures of analysis of variance were performed to assess the effects of response variables through time (three time points) in the intervention and control groups. The sphericity assumption (that the variances of the differences between all possible pairs are equal) was tested and confirmed (P > 0.05) in advance. We have compared mean self-concept scores from three time points and between two groups. In addition, other factors, such as gender and doing sports (yes/no), were added to the model as the covariates of no interest. Analysis was completed using SPSS 20.00 and a P value below 0.05 was considered significant. The results of the study showed that the average age was 9.50 ± 1.74 in the intervention group and 9.29 ± 1.56 in the control group. As it is shown in Table 1, the majority of the cases under study in both groups were first- or second-born children, and their first blood transfusion was before the age of one in 70% of the cases in the intervention group and in 68% of the cases in the control group. Both groups were identical in terms of demographic features. bSignificant at α level less than 0.05.
dChi2 and Fischer’s Exact test. Repeated Measures ANOVA results revealed that the mean self-concept score was significantly different for the three time points (P = 0.006). For the intervention group, the trend was increasing (Figure 2). Post-hoc analysis showed that the mean self-concept score was significantly higher at the second time point compared to the first (P < 0.001), rising from 60.539 to 69.908. Likewise, comparing the first and third time points, the mean score increased significantly and reached 70.611 (P < 0.001). Furthermore, the change in mean score from the second to the third time point, though non-significant (P = 0.509), followed the trend, rising from 69.908 to 70.611 (Table 2). The mean self-concept scores in children for the experimental and control groups at three time periods. bP value base on the repeated measures ANOVA test. cDifference between average after test and average before test. dSignificant at α level, less than 0.05. For the control group, the trend was first increasing and then decreasing, but there were no significant alterations (Figure 1). According to the post-hoc analysis results, the mean self-awareness score increased from 57.139 at time point one to 58.533 at time point two (P = 0.623) and decreased to 55.955 at the third time point (P = 0.655). Comparing the second and third time points did not indicate any significant change in mean score either (P=0.117) (Table 2). Additionally, the mean self-concept scores of the two groups were compared at each time point. We observed no difference at the first time point (P = 0.313), but the self-concept score was significantly higher (P < 0.001) for the intervention group compared to the control group at both the second and third time points. The present research studies the effects of group games on the self-concept of children ages 7 to 11 years old suffering from thalassemia major. In confirmation of our hypothesis, the data analysis via statistical tests indicated that group games positively affect self-concept among children suffering from thalassemia major. Playing games is a proper means of therapy and education for children. Play therapy is an appropriate developmental intervention for children (31). The healing power behind playing games can be used in various ways in order to teach adaptive behaviors for children with deficient social and emotional skills (29). For children, the need to play games is a deep and fundamental necessity that requires special attention in the same way as physiological needs. Playing games improves self-concept and might also decrease or eliminate social and behavioral problems in children (32). Various studies confirm the effects of playing games on different social, emotional, behavioral, and physical aspects of life and also on tension-triggering stimuli, such as disease, recurrent admissions to hospitals, divorce, death, domestic violence, and physical and sexual abuse (29). A few examples include: teaching visual games with motor-perceptual interventions to children in hospitals with emotional problems (33), comparing group games and individual play in children who were sexually abused (34), and comparing children’s individual play and play with siblings among children who were victims of domestic violence (35). In his research on the effects of group games on self-concept among children with leukemia, Salmani (2002) stated that self-concept scores in the intervention group increased significantly after some sessions of group games (36). In a study on the effects of cognitive-behavioral group therapy on enhancing self-esteem and reducing despair in adolescents with thalassemia in 2010 (11), Kiani stated that the self-confidence level in the intervention group improved post-intervention (evaluated via the Cooper-Smith Scale) compared to that found in the control group (8). Kouvava et al. (2011) conducted research on 11 boys and nine girls ages 7 to 8 years old who had weak interpersonal and social skills. The results stated that musical and role-playing games are beneficial in improving the children’s social skills and self-concept (37), which is consistent with the results of the study at hand. However, the questionnaire used in this study was different, leading to the conclusion that even with different means of evaluation, the effects of playing are confirmed. In research carried out on children ages 7 to 9 years old with behavior disorders, Zare and Ahmadi (2007) also observed a decrease in the average score among children with behavioral disorders such as aggression, depression, anxiety, social maladjustment, and attention deficit disorder after play interventions via the cognitive-behavioral method as displayed in Rutter’s Behavior Questionnaire. The statistical tests also indicated a significant difference in the average scores pre- and post-intervention (38). The results of that study are consistent with the results of our study. However, a different questionnaire was used, which again confirms the effects of playing, even with a different means of evaluation. Playing games is a suitable means of therapy and education for children. Play therapy is an appropriate developmental intervention for children (31). Furthermore, in a study conducted with 18 young female felons in Tehran, Albadi and Ronaghi (2002) declared that the self-concept scores in the intervention group had improved remarkably post-intervention compared to the control group. Coloring mandala patterns had a role in reducing their anxiety and improving their self-concept (39). Additionally, in a study of 60 children from the kindergartens of Shiraz in the school year 2005 - 2006, Emami Rizi et al. (2011) found that children’s creativity scores had increased following group play in the intervention group. Playing games in groups had affected the children’s verbal creativity. Moreover, holding group play sessions helped to develop the children’s ability to interpret images (40). In a study conducted with 720 children ages 3 to 12 years old, Aghajani Hashtchin (2011) found a significant change in the dependent variables of social skills. After comparing their results with those of similar studies around the world, they stated that playing games results in stronger social skills (32). In a study in 2003, Salmani observed a significant difference between the scores of self-concept pre- and post-intervention in the intervention group (36). In his research in 2002, Mirbagheri stated that the average score of self-concept in the intervention group before and immediately following intervention significantly changed for the intervention group (41). In a study in 2010 on the effects of play therapy in Ethiopia, Nigussie (2010) notes a significant difference in the intervention group’s scores for life skills, concentration level, and self-confidence prior to and after the intervention (42). The results of the study by Goymour et al. (2000), carried out in the pediatric hospital of Sydney, Australia, showed that post-intervention, the level of anxiety in the intervention group was significantly lower compared to pre-intervention. Furthermore, self-concept did not change in the control group, but was found to rise to a higher level in the intervention group a month after the intervention (15). In contrast, the results of a study by Jalali et al. (2008) showed no significant differences between the levels of fear in the intervention group pre- and post-intervention (43). In a study on the effects of cognitive-behavior group play therapy on social phobia in children ages 5 to 11 years old, Jalali et al. (2011) stated that play therapy in the follow-up stage (two months post-intervention) was effective in decreasing phobia in the intervention group (43). The results of that study, like those of the study at hand, confirm the enhancement of self-concept in the intervention groups. It appears that no other study was conducted concerning the long-term effects of play therapy on self-concept among children; thus, the present study is the only reliable source of data. The benefits of group therapy sessions in enhancing the self-image of children suffering from thalassemia major are vividly displayed in the present study. Furthermore, our findings are consistent with those of the studies conducted by Salmani (36), Mahmoudi-Gharaei et al. (44), Jalali et al. (43), Zareapour et al. (17), Barzegary and Zamini (45), Goymour et al. (15), Dutta and Mehta (46), William et al. (20), Nigussie (42) and Tekin and Sezer (31). In the present research, the therapy took place in eight play sessions, two times a week, each lasting 45 to 60 minutes. Games using play dough and mud were each played during four sessions. The intervention in the study conducted by Jalali (43), however, took place once a week (six sessions, 60 minutes each) and used dolls and stuffed animals in most sessions, playing with play dough only in the final session. The current study showed that group play improved self-concept in the intervention group consisting of girls and boys ages 7 to 11 years old. Schmidt and Cagran (2008) suggest that a child’s self-concept may be affected by influential people, such as teachers, peers, parents, and their comments, as well as by self-comparisons with others in the society (47). Thus, one of the most noteworthy factors affecting a child’s self-concept is lack of communication with friends and peers, which can be eliminated to some extent when they take part in group game sessions with peers. Considering the findings of the present study, it is recommended that nurses prepare a suitable base for improving interpersonal relationships by setting proper examples for the relationships between children suffering from thalassemia and the treatment staff. In addition, we suggest that those preparing the essential facilities and proper environment for treatment employ this method for children in all hospital units. Similar studies should be conducted for children with other chronic diseases, considering the great effects of group play therapy on self-concept in children with thalassemia. There are no similar studies with which to compare our results, which is a clear limitation. The kind cooperation of the respected authorities and personnel of the Thalassemia wards of Taleghani Pediatric hospital of Gorgan and Gonbad is greatly appreciated. Authors’ Contribution: All authors have participated in the study.